There is a point where pleasure and pain intersect. Once the line is crossed, once Mo's hot sauce touches your lips, there is no going back. His special blend of habanero peppers, carrots, garlic, lemon and lime will leave you addicted with Pain Is Good Batch 37 Garlic Style Hot Sauce! 7.5oz. Ingredients: habaneros, water, carrots, garlic mustard (distilled vinegar, water, mustard seed, salt, turmeric, paprika, spice, garlic, powder), white vinegar, onion powder, olive oil, lemon and lime juice concentrate, and spices. I really like this hot sauce. 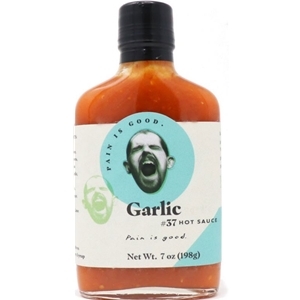 It has a strong habanero and garlic flavor. It's hot but the heat is manageable. I use this with blue cheese dressing for my salads and I put it in soup. An all-time classic. Discovered this in 1998 at a shop in the NoLa French Market and never looked back. The unexpected winning ingredient: carrots! If it weren't for Batch 114, then this sauce would reign supreme. This is the sauce that started my journey into the next level of heat. I'm at the ghost pepper level now, but this sauce can be used liberally to add any amount of heat that you want. It's good stuff, just not quite as flavorful as Batch 114, the Jamaican Pain Is Good experience. UPDATE: I went back to this sauce, tried it again, and have to say, "It's great!" Okay, I'll have several great hot sauces to choose from. Just buy from SalsaExpress, and you can't lose! Outstanding! I use it as a main ingredient in my wing sauce.